Save $1500 when you order NOW! You are kindly invited to participate in our Intensive TOP Performance Traders Boot Camp during the weekend of October 6th and 7th 2018. If you are already an Advanced Trader but have been losing money and/or have not managed to become a consistent winner who trades professionally for a living, this Intensive TOP Performance Traders Boot Camp will be of incalculable value for you. Because performance psychology IS The Most Important and at the same time, Neglected Element of Successful Trading. During this training we will be digging precisely into the issues that have stopped you so far from becoming the professional trader that you deserve to be. Most traders try to become successful by learning new strategies, set ups and indicators. They spend at least three years in their search while continuing to lose money in their trading all the while buying more useless courses. No matter how much we are told that the secret of trading truly lies in Risk and Psychology, we insist in learning a new set up. Warning: The single biggest obstacle to you making big money in trading is the wholly erroneous idea that you need yet another course to learn new set ups and trading strategies. It’s in our make up, I guess. Bold independent rebels, all of us. Growling at the universe and daring Fate to mess with our plans. Day in and day out we see the market coming to hit our protective stops and then move in our direction. We can hardly take it! We struggle with ourselves, we decide to make our stops bigger or even move into swing or position trading. But now we lose even more per trade. The Solution In An Empty Cabinet! The next step is of course to look for another course or another indicator and the story repeats itself for several years. In simple words, it’s like we keep looking for a file with the solution in an empty file cabinet. If the answer to successful trading were in the conscious mind, everybody would be a successful trader by following a few logical rules. But the real answer lies where nobody looks: inside themselves. In a nutshell you will learn how to apply strategies of brain training and positive performance psychology into your trading. But you’ll also learn the effect that the market has on a trader, and… The effect that a trader has on the market. You will learn an approach to trading developed from the newest findings from Neuroscience along with meditation and exercises that are scientifically proven to enhance all areas of knowledge and Intelligence. That includes pattern recognition, memory, perception and even how to work with your intuition and the parts of your unconscious that have been blocking your progress thus far. In fact, there is a lot more to learn in this Boot Camp and we are offering it to you for a deep discount. The normal price for this training is $1,997 for the full weekend. But you can get it today as an early bird for only $497 and save $1,500.00. We have structured everything so at the end of the two intensive days you will have a new mindset. Make no mistake, the strategies of brain training you will be learning during this Trading Psychology Boot Camp are simple, but that does not mean they are “easy”. You do have to take advantage of the interaction with experts Kristin and Aldo. After applying these techniques both for themselves and with thousands of their students, they have gotten pretty good at creating great results. After all, Aldo is one of the most sought after and highest paid trading mentors in the industry for a reason. So if you are finally ready to kick your career and trading up a few levels (where trading is no longer a struggle but a great pleasure and the lifestyle options will blow your mind)... then it is time you join us for an entire weekend where you can interact with Kristin and Aldo. And you should do this whether you’re still early in your career (brimming with questions and challenges) or a battle-tested veteran seeking effective ways to control your risk and be a master of your own emotions. It’s time to set your next goals! This way you will be moving forward. Growing. Earning your living as a trader, experiencing more freedom while having more fun. 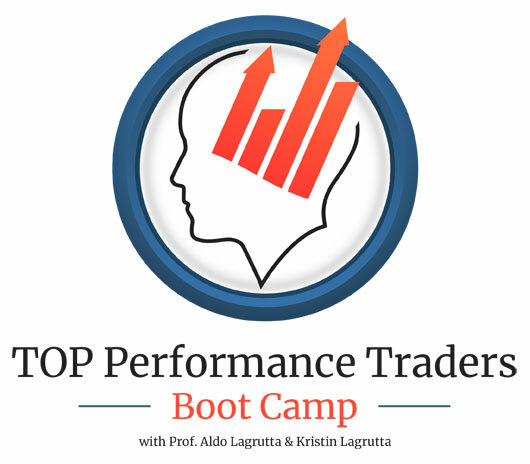 BTW... You may be surprised at how inexpensive we are pricing the Trading Psychology Boot Camp. The reason is that we see so many people charging huge amounts of money for material that is not worthy at all. Thus, we have taken it upon ourselves to deliver the maximum amount of value for the least possible price.